Nazi Art Trove Includes Previously Unknown Matisse, Chagall Works : The Two-Way Of nearly 1,400 oil paintings, prints and other works, 1,285 had been stacked in a drawer, unframed. They include work by German expressionists such as Franz Marc and Max Beckmann, in addition to previously unknown paintings by Marc Chagall and Henri Matisse. Please note: The image quality in this gallery was degraded by the light used to display the work at a news conference in Germany. We're including the photos to impart a general idea of the range of works in question. 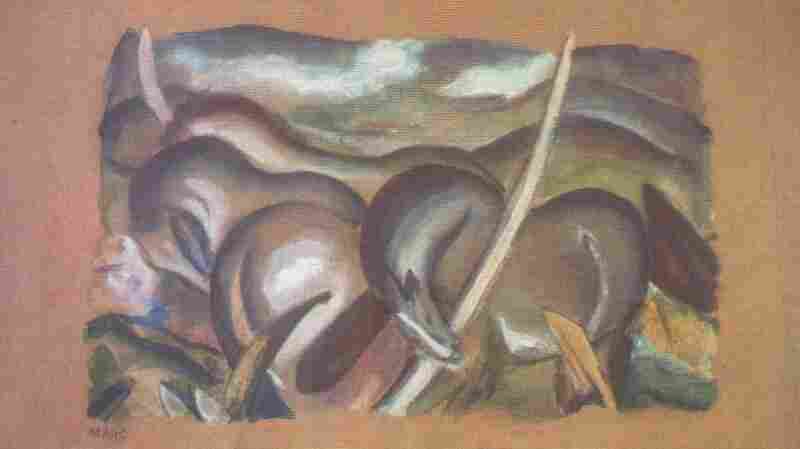 A painting by Franz Marc, Horses in Landscape. 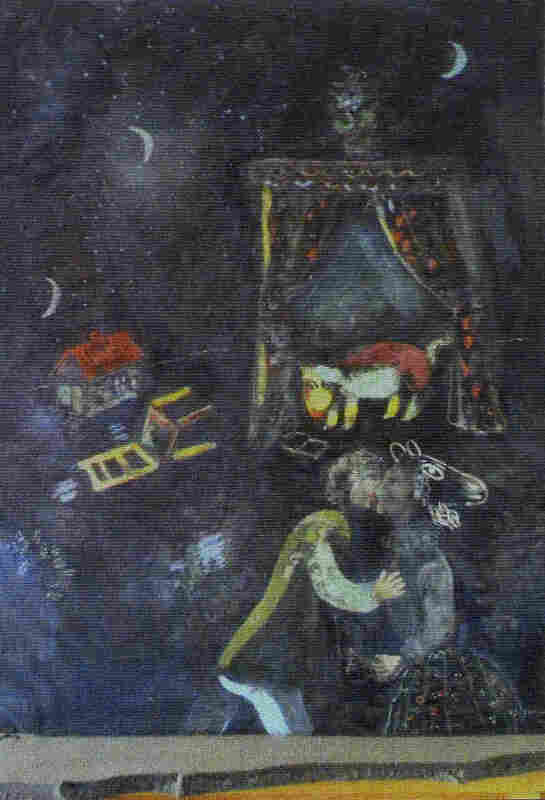 A painting by Marc Chagall. A painting by Otto Dix. 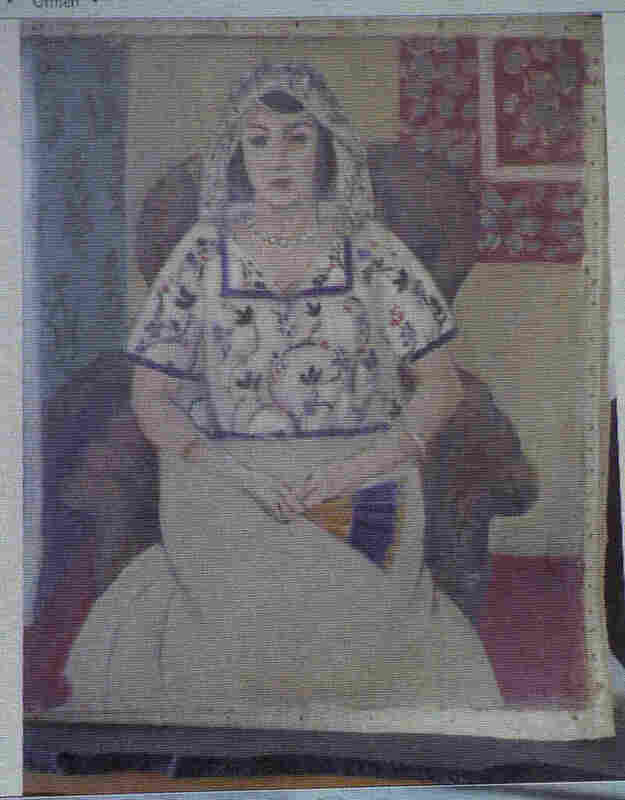 A painting by Henry Matisse, Sitzende Frau ("Sitting Woman"). 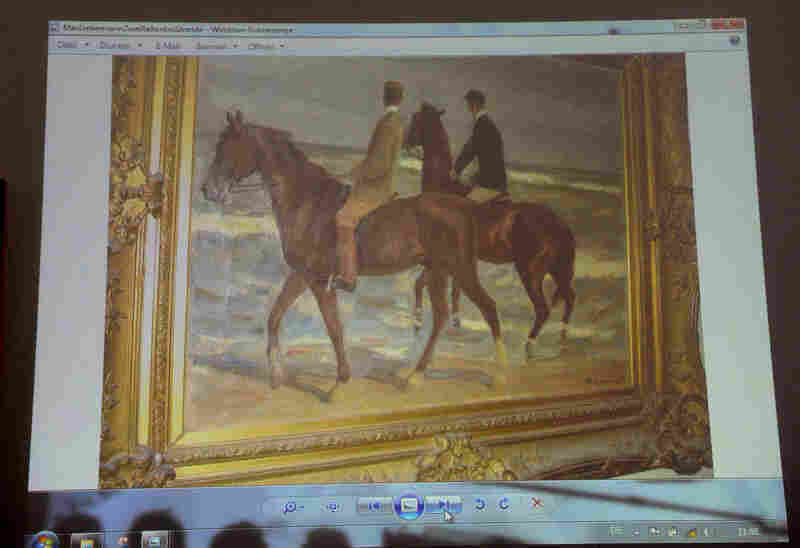 A painting by Max Liebermann, Zwei Reiter am Strande ("Two Riders on the Beach"). The revelation Monday that more than 1,000 paintings and prints seized by the Nazis during World War II were found in a Munich apartment has set off excitement in the art world and spurred anger among Jewish groups that German officials didn't publicize the discovery when it was first made. With a potential value of $1.35 billion, the trove of art contains previously unknown works by Henri Matisse and Marc Chagall; other artists represented include Pablo Picasso, Auguste Renoir and Henri de Toulouse-Lautrec. The stash of art was reported by Germany's Focus magazine Monday, under the headline "The Nazi Treasure" (Der Nazi-Schatz). Tax officials discovered the cache when they visited the cluttered Munich apartment of Cornelius Gurlitt, a descendant of a man who was an official in wartime Germany. Of nearly 1,400 oil paintings, prints and other works, 1,285 had been stacked in a drawer, unframed. They include work by German expressionists such as Franz Marc and Max Beckmann, in addition to a previously unknown self-portrait by Otto Dix. The trove also includes Albrecht Dürer and Canaletto, who worked in earlier centuries — a detail that could make the collection's origins even more difficult to explain. Some of the works were almost certainly looted by the Nazis; others were sold by Jewish collectors who were under extreme duress. And some works were culled from German museums for being "degenerate art" that didn't conform with Nazi ideology. German officials have asked art historian Meike Hoffmann to examine the works — and perhaps provide clarity for their clouded history. "All these paintings and prints are in a very good condition," Hoffmann said Tuesday, according to The New York Times. She said it's not possible to put a price on the collection, saying, "Of course it is of a very high value for art historians." Hoffmann says it could take years to trace the works' origins. She added that there are no signs that any of the art was forged — and that they had a powerful effect when she was confronted with them. "It was very emotional for me to see all these works and to realize they still exist," Hoffmann said, according to Agence France-Presse. "This case shows the extent of organized art looting which occurred in museums and private collections," Ruediger Mahlo, the German representative of the Conference on Jewish Material Claims against Germany, tells Reuters. "We demand the paintings be returned to their original owners," he said. "It cannot be, as in this case, that what amounts morally to the concealment of stolen goods continues." Officials say they found the art in early 2012, contradicting the Focus report that the discovery occurred in 2011. But they confirmed that officials in Berlin have known of the find for months. "Cornelius's father Hildebrand Gurlitt was from 1920 a specialist collector of the modern art of the early 20th century that the Nazis branded as un-German or 'degenerate' and removed from show in state museums. "Nazi propaganda minister Joseph Goebbels recruited Gurlitt to sell the 'degenerate art' abroad to try to earn cash for the state. 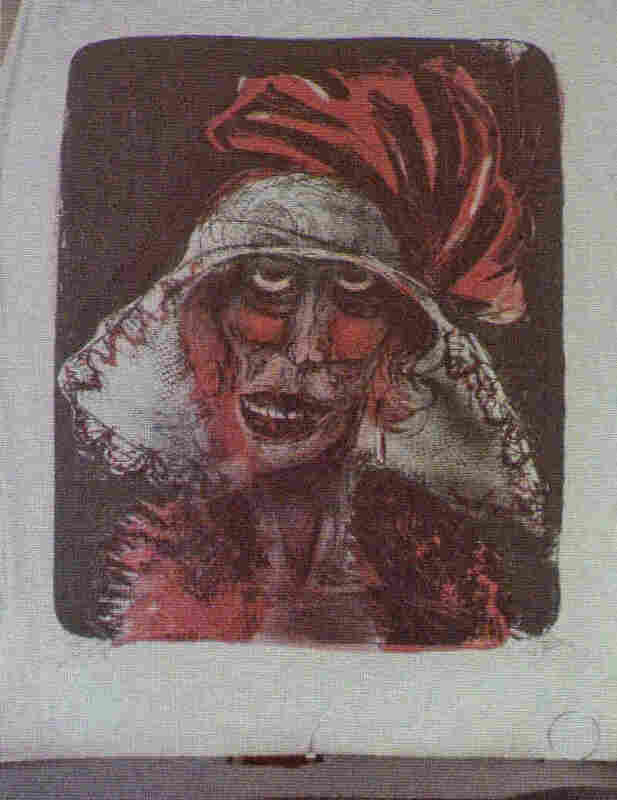 Gurlitt bought some for himself and also independently bought art from desperate Jewish dealers forced to sell. "After the war he persuaded the Americans that, as he had a Jewish grandmother, he himself had been persecuted. He continued working as a dealer and died in a traffic accident in 1956." As Der Spiegel reports, the elder Gurlitt also said his collection had been destroyed in the 1945 firebombing of Dresden. On Tuesday, officials said that Cornelius Gurlitt, 76, first attracted the suspicion of tax investigators in 2010, when a routine check on a train from Zurich to Munich revealed that he was carrying thousands of dollars' worth of cash. An attorney for the heirs of Jewish art collector Alfred Flechtheim says the family will look into the find for possible ties to his estate, reports Der Spiegel. The magazine says that any art transactions that took place after 1933 are susceptible to review as possible Nazi plunder. News of the discovery is also coming out as Jewish and historical groups prepare to observe the 75th anniversary of Kristallnacht, the Night of Broken Glass, a series of coordinated attacks in which tens of thousands of Jews were beaten or arrested between Nov. 9 and Nov. 10, 1938. Thousands of Jewish businesses, homes and synagogues were ransacked or destroyed in that event, widely seen as a turning point in Nazi Germany's attempts to destroy Jews and their culture.